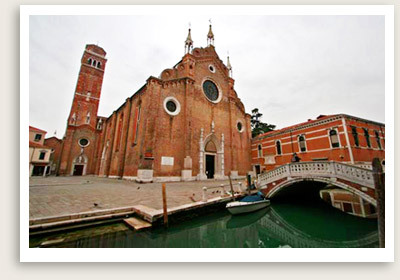 Venice Private Tour Includes: Our private tours of Frari church & Scuola San Rocco tours include services of your private, licensed tour guide and entrance tickets to the Frari Church and Scuola di San Rocco. A Venice Tour For Art Lovers. Embark on an upscale private tour of Venice. Your private guided tour of Venice starts at the Frari campo (square), where you will see the mark left by various foreign communities who lived here through history. Inside the Frari Church, your Venice tour guide can lead you to retrace the history of Venice and admire Italian art from the 13th to the 19th century. Here you can view original masterpieces by Giovanni Bellini and Titian. Then, around the corner, you will enter San Rocco Square, where you can visit the site of the celebrated San Rocco brotherhood, adorned with Tintoretto’s masterpieces dating from the late Renaissance.